When I did this year’s spring cleaning, I found a pretty white skirt in my wardrobe. I still like it a lot, but I’m not wearing it at all. Last week I decided to give it new look and I came up with this dress. I thought the ripples could be nice for the top. You can vary the size of your top by using different types of material and size of hook. Another way is increasing or decreasing number of the ripples. Note: I have had a few emails, that some of the charts on my blog are hard to read. If you’ll have a problem, e-mail me, at emmhouse@seznam.cz and I’ll send you the original scan I have. That way you can easily enlarge it. 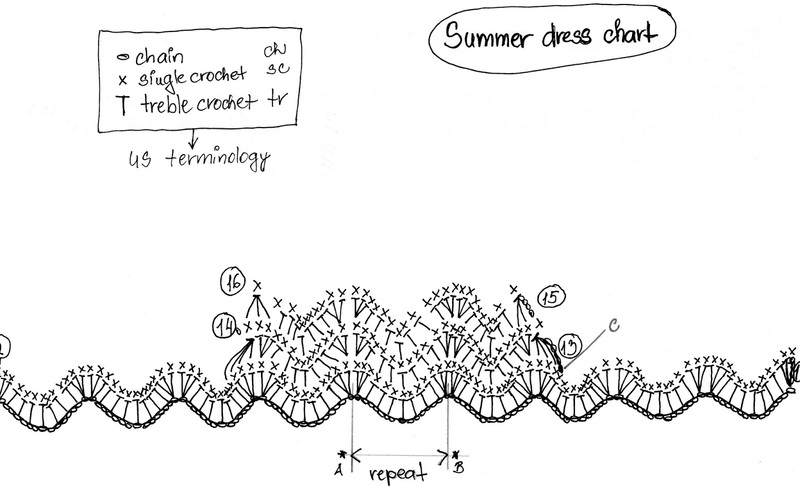 Note: Since I had problem to fit whole chart on one piece of paper I had to use a different symbol for treble crochet than is usual. 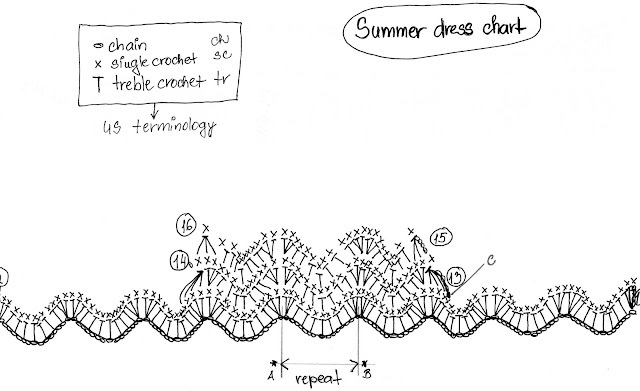 The pattern is repeating every 15 stitches. Row 2: In every even row make sc in every stitch. Repeat rows 1 & 2 five times (all together 12 rows). Fasten off. Start the higher top with row 13 from the right side. It’s indicated with letter C on the chart and follow the chart. Finish with row 16 – fasten off. Assembly: I sewed the skirt to the top by using sewing machine first, added the zipper on the backside of the top. Then I sewed the stripes on last. Stripes: For one stripe I have used five 140cm (56”) strings of the cotton and twisted them together. Just wanted to let you know I think this is adorable. Although I'm a little old to be wearing this, (56) I'm gonna try and make it anyway. lol Thank you so much. OLD? I'm 55, so we can wear our halters and be young together! LOL! I refuse to let my age dictate how I should dress, no matter what my 24 yaer old daughter may say.Good luck with your top, Kathy! I think people should wear what they feel comfortable in. This dress, with the right bra, can be worn by women of any age and it looks pretty. Age is no barrier to looking good, so go for it :-). I think your US terminology in the diagram is wrong. it should be two strokes instead of one, one is a regular dc, unless it is dc instead of tr. please let me know. Hi, there is a note with explanation right above the chart. Nice design, you have a great crafting hand. White it´s the best color to wear in summer in clothing for woman , this way you can stand more comfortable in the sunlight.